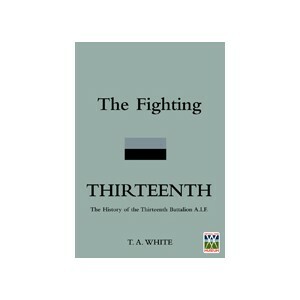 FIGHTING THIRTEENTH The History of the 13th Battalion A.I.F. by Captain Thomas A.White. 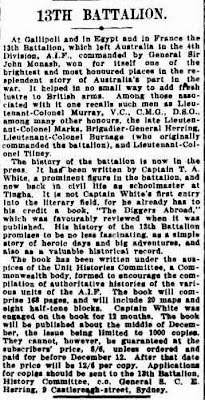 The Author, Captain Thomas Alexander White was married and near 30 years old when he joined the AIF on the 17th June 1916. He had completed a degree at Sydney University and prior to the war was a teacher. During his time at Sydney University he had joined the University Scouts and the 13th Battalion Militia. 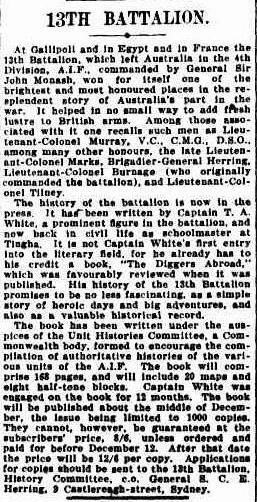 Men of such academic and military background were keenly sought by the AIF. Therefore, upon joining he attained an Officer’s commission of a 2nd Lieutenant. He was a Bombing Officer and while out of the line a Billets Officer with the Battalion. At Villers Bretonneax on the 20th May 1918, he was wounded by a bomb dropped from a German aircraft. 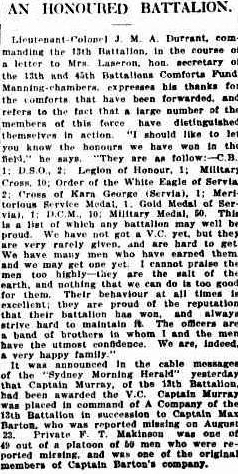 He remained with the 13th Battalion throughout WWI. He returned to Australia in 1919 and continued his teaching career as Headmaster at Gresford Public School. Gresford is a rural town located northwest of Newcastle in NSW. In 1921, he published a military book of his war experiences titled, “Diggers Abroad”. He completed writing this history in 1923. He died in 1962. The Victoria Cross Medal for supreme gallantry was awarded to two members of the Battalion, Capt. H. W. 'Mad Harry' Murray and Sgt. M. V. Buckley.
' Mad Harry ' Murray VC CMG DSO (Bar) DCM Croix de Guerre was also distinguished as the most decorated soldier in the British Allied infantry in WWI. The 13th Battalion Members dedicated The Fighting 13th Battalion Book to two Commanders of the Battalion. They were Colonel G.J. Burnage CB VD ‘The Gamest Old Man our First Commander’ and to the ‘Memory of our Gallant Young Colonel the late Douglas Gray Marks DSO MC Serbian Eagle’. Marks was the youngest Colonel to command a Battalion in the AIF. As fate has it, he survived the war only to drown at Palm Beach Sydney while attempting a rescue in 1920 – he was only 24 years old. 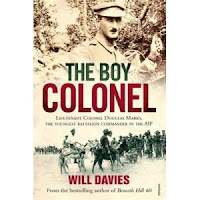 His life story is now the subject of a book titled ‘ The Boy Colonel by Will Davies.